Stroke systems of care need to advance as stroke care has. Improved accuracy for identifying those having a stroke and accurate predictability of LVO during prehospital triage is crucial. Prehospital screening tools that are less time consuming and at the same time accurate and simple to deliver are preferred. Stroke identification tools like Cincinnati prehospital stroke scale (CPSS), Los Angeles prehospital stroke scale (LAPSS), and face, arm, speech, time (FAST) are used by emergency medical service (EMS) teams when stroke is suspected. 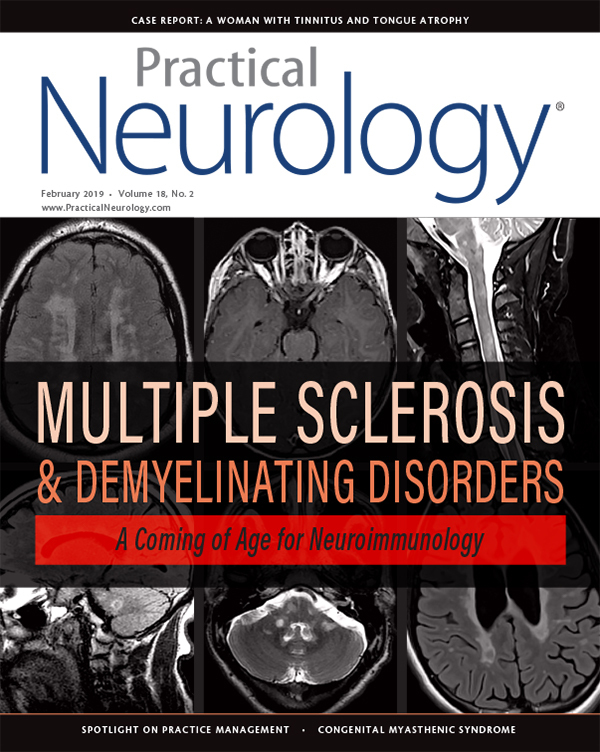 In order to identify LVO among these patients, multiple severity-based screening tools (eg, Los Angeles motor scale [LAMS], field assessment stroke triage for emergency destination [FAST-ED], Cincinnati stroke triage assessment tool [C-STAT], and rapid arterial occlusion evaluation [RACE] have shown reasonable accuracy in large datasets.3-6 The vision, aphasia, neglect assessment tool is simple, fast to administer, and provides categorical designation of LVO positive vs negative with a very high negative-predictive value.7 Validation of its accuracy in the prehospital setting is needed. Accurate triage at the prehospital level can change outcomes for patients who otherwise would have poor outcomes. Current American Heart Association (AHA) guidelines recommend against bypassing a thrombolysis-capable hospital if the distance to reach an endovascular surgery-capable hospital requires 15 minutes or more additional transport time for patients with suspected LVO that had onset within 6 hours.8 Although this model is applicable for big cities and towns with both primary stroke centers (PSCs) and comprehensive stroke centers (CSCs), in more rural areas, even the closest stroke-ready hospital might be more than 15 minutes away and the nearest thrombectomy capable hospital may be more than 1 hour away. Applicability of this protocol in patients outside of the time window for intravenous (IV) thrombolysis is also debatable. If a patient does not meet criteria for IV thrombolysis, but has a positive LVO screen and is within 24 hours of last seen normal, why not continue on to a thrombectomy center—where timely consideration of revascularization with penumbral imaging that is often limited to these centers—can be provided? Another conditional-probability model tested optimal triage and transport strategy with a recommendation that triage decision be individualized based on region as transport strategy depends on treatment times at facilities, transport time between facilities, and triage tools in use.11 The RACECATa trial is the only randomized controlled trial evaluating outcomes based on direct transport to endovascular centers vs stopping at a thrombolysis center followed by secondary transfer. Vascular imaging with either a CT angiogram (CTA) or MR angiogram (MRA) is a noninvasive method to confirm LVO. If a patient is taken to a center capable of providing thrombolysis but not thrombectomy, obtaining CTA/MRA in a timely manner will confirm the diagnosis of LVO and thus emergent transfer. The timing of obtaining perfusion imaging either at a final destination hospital vs a first-stop hospital is also debatable. Utilizing perfusion imaging at a remote hospital will be helpful in excluding patients with small or no penumbra. However, perfusion imaging is just a snapshot in time and patients’ salvageable tissues might still decay during transport. Penumbral decay and infarct growth are directly associated with collateral status as demonstrated in a multicenter study of untreated patients with LVOs.12 Factoring in collateral status in transfer decision making needs to be explored in a prospective study. Figure. Mobile stroke units equipped with teleradiology and specially trained personnel may shorten the time to thrombolysis and eventual thrombectomy. Establishing mobile endovascular teams in high stroke-density regions could mitigate the need for interhospital transfers. 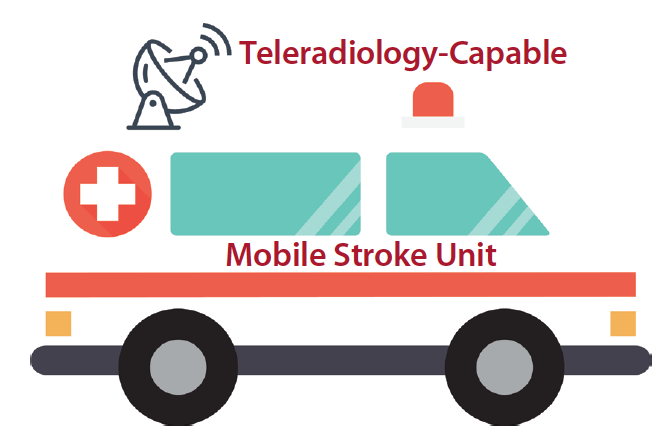 Mobile stroke units (MSUs) (Figure) equipped with CTA would also shorten the onset to thrombolysis times and enable correct hospital destination. However, the cost-effectiveness of establishing and maintaining MSUs remains unknown. Although sonothrombolysis did not show significant benefit when combined with IV thrombolysis, exploring use of this technology during interhospital transfer for LVO may help improve outcomes. Quality improvement programs to minimize door-to-needle time and door-in-door out time for transfers need to be established and implemented at the local level. In conclusion, it is unlikely that a single protocol is going to fit all due to diverse distribution of stroke centers and stroke density. Ultimately, transfer protocols based on region and stroke density will have to be implemented in conjunction with factors such as collateral status, LVO location, and distance between facilities. a. Direct transfer to an endovascular center compared to transfer to the closest stroke center in acute stroke patients with suspected large vessel occlusion (NCT02795962). 1. Goyal M, Menon BK, van Zwam WH, et al. Endovascular thrombectomy after large-vessel ischaemic stroke: a meta-analysis of individual patient data from five randomised trials. Lancet. 2016;387(10029):1723-1731. 2. Smith WS, Lev MH, English JD, et al. Significance of large vessel intracranial occlusion causing acute ischemic stroke and TIA. Stroke. 2009;40(12):3834-3840. 3. McMullan JT, Katz B, Broderick J, Schmit P, Sucharew H, Adeoye O. Prospective prehospital evaluation of the Cincinnati Stroke Triage Assessment Tool. Prehosp Emerg Care. 2017;21(4):481-488. 4. Noorian AR, Sanossian N, Shkirkova K, et al. Los Angeles Motor Scale to identify large vessel occlusion: prehospital validation and comparison with other screens. Stroke. 2018;49(3):565-572. 5. Perez de la Ossa N, Carrera D, Gorchs M, et al. Design and validation of a prehospital stroke scale to predict large arterial occlusion: the rapid arterial occlusion evaluation scale. Stroke. 2014;45(1):87-91. 6. Perez de la Ossa N, Ribo M, Jimenez X, Abilleira S. Prehospital scales to identify patients with large vessel occlusion:it is time for action. Stroke. 2016;47(11):2877-2878. 7. Teleb MS, Ver Hage A, Carter J, Jayaraman MV, McTaggart RA. Stroke vision, aphasia, neglect (VAN) assessment-a novel emergent large vessel occlusion screening tool: pilot study and comparison with current clinical severity indices. J Neurointerv Surg. 2017;9(2):122-126. 8. Powers WJ, Derdeyn CP, Biller J, et al. 2015 American Heart Association/American Stroke Association focused update of the 2013 guidelines for the early management of patients with acute ischemic stroke regarding endovascular treatment: a guideline for healthcare professionals from the American Heart Association/American Stroke Association. Stroke. 2015;46(10):3020-3035. 9. Benoit JL, Khatri P, Adeoye OM, et al. Prehospital triage of acute ischemic stroke patients to an intravenous tPA-ready versus endovascular-ready hospital: a decision analysis. Prehosp Emerg Care. 2018;22(6):722-733. 10. Froehler MT, Saver JL, Zaidat OO, et al. Interhospital transfer before thrombectomy is associated with delayed treatment and worse outcome in the STRATIS Registry. Circulation. 2017;136(24):2311-2321. 11. Holodinsky JK, Williamson TS, Demchuk AM, et al. Modeling stroke patient transport for all patients with suspected large-vessel occlusion. JAMA Neurol. 2018 75(12):1477-1486. 12. Vagal A, Aviv R, Sucharew H, et al. Collateral clock Is more important than time clock for tissue fate. Stroke. 2018;49(9):2102-2107. President & CEO - Dr. Brain, Inc.
DN reports no disclosures. SM-S is a member of the speakers’ bureau for Genenetech.